Carl Eller, Gary Larsen, Alan Page, Jim Marshall. 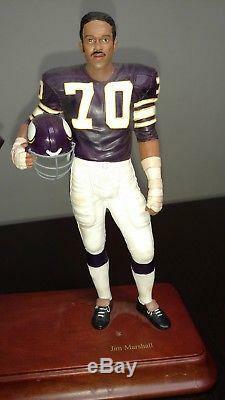 Purple People Eaters were the defensive line of the Minnesota Vikings from the late 1960s to the late 1970s. The term is a reference to a popular song from 1958, the efficiency of the defense, and the color of their uniforms. The motto of the Purple People Eaters was Meet at the quarterback. 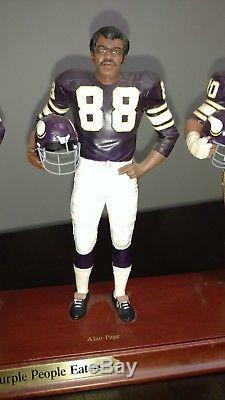 Defensive tackle Alan Page, 9 Pro Bowl Selections (19681976), NFL MVP (1971), Hall of Fame. Defensive end Carl Eller, 6 Pro Bowl Selections (19681971, 19731974) Hall of Fame. Defensive end Jim Marshall, 4 Pro Bowl Selections (19681971). Defensive tackle Gary Larsen, 2 Pro Bowl Selections (19691970). One of the original members of the defensive line, Gary Larsen, was replaced in the mid-1970s by Doug Sutherland. 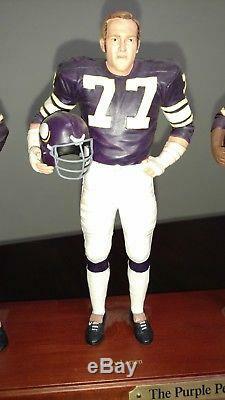 Marshall said that the players disliked "Purple People Eaters" and called themselves "The Purple Gang", but "we've got to ride with it because it's our handle". The group was a major factor in the post-season success of the Vikings from the late 1960s through the 1970s. Carl Eller and Alan Page were inducted into the Pro Football Hall of Fame. Many fans, players, coaches and sports writers argue that Jim Marshall should be in the Hall of Fame as well. 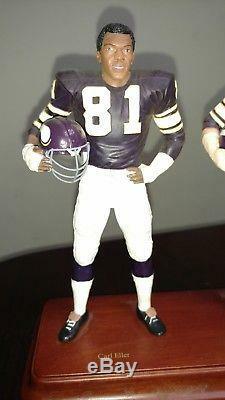 The item "Very Rare Minnesota Vikings Purple People Eaters Danbury Mint" is in sale since Sunday, February 4, 2018. This item is in the category "Sports Mem, Cards & Fan Shop\Fan Apparel & Souvenirs\Football-NFL". The seller is "guinabbiegracie" and is located in Danbury, Connecticut. This item can be shipped to United States.